Figure 16.12. Two conformations of the translational operator (leader sequence with the translation start sequence) of the mRNA coding for ribosomal protein S15. The two-hairpin conformation (A) seems to be inactive in ribosome binding and initiation because of the closure of the RBS. The spontaneous transition into the pseudoknot conformation (B), possibly stimulated by initiating ribosomal particles, opens the RBS. After initiation the ribosomes exit from the pseudoknot due to the equilibrium between the conformations. Protein S15 has an affinity to the pseudoknot conformation (B), shifts the equilibrium towards it and stabilises the pseudoknot. As a result, the initiating ribosome is found to be trapped by the pseudoknot structure, and thus the translation is repressed. (Reproduced, with modifications, from C. Ehresmann, C Philippe, E. Westhof, L. Benard, C. Portier & B. Ehresmann, in "Frontiers in Translation ", A.T. Matheson, J.E. Davies, P.P. Dennis & W.E. Hill, eds., (Biochem. Cell Biol. 73), p.p. 1131-1140, 1995, with permission). 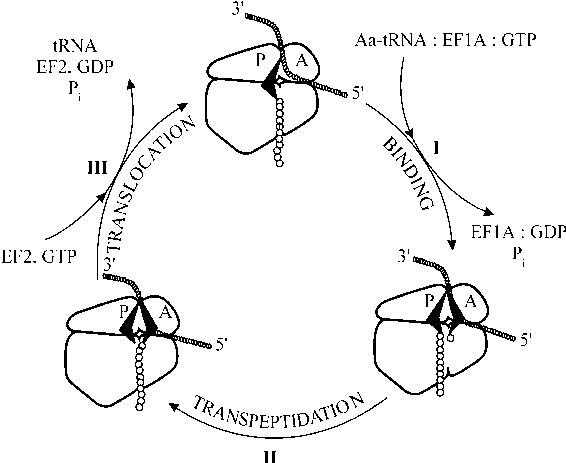 course of translational repression, has been confirmed by another series of facts. It has been demonstrated that ribosomal RNA added to the translation system removes the repression exerted by a corresponding ribosomal protein. Thus, in experiments in vitro the repressory action of protein L1 upon the synthesis of proteins L1 and L11, as well as the inhibition of the synthesis of proteins L10 and L7/L12 by the L10:(L7/ L12)4 complex, can be prevented specifically by adding ribosomal 23S RNA. Figure 16.13. Model for ribosomal protein autoregulation. The newly synthesised ribosomal proteins bind to their sites on ribosomal RNA and assemble into ribosomal particles (the right part of the scheme). 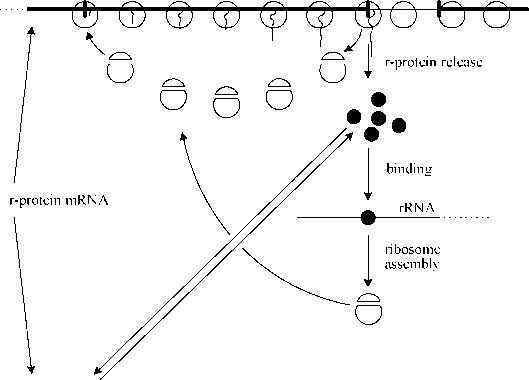 When ribosomal proteins are in excess, some of them bind to a target site (translational operator) on their own polycistronic mRNA (the lower part of the scheme). Threonyl-tRNA synthetase (ThrRSase) is coded by the first cistron, thrS, of the polycistronic message comprising also cistrons infC coding for IF3, rplT coding for the ribosomal protein L20, pheS and pheT coding for the two subunits of PheRSase, and himA coding for the protein called "host integration factor" (Springer & Grunberg-Manago, 1987). Translation of the thrS cistron has been shown to be repressed by the product of the translation, ThrRSase. The presence of an excess of the substrate, tRNAThr, abolishes the repressory action of the ThrRSase, and the enzyme is synthesised. Hence, only when the enzyme is in excess, it represses the translation of its own mRNA and thus stops its further production. Threonine starvation leading to the accumulation of deacylated tRNAThr derepresses the thrS mRNA. Under normal growth conditions the sequestration of aminoacylated tRNAThr in the complex with EF-Tu:GTP allows the free synthetase to repress the thrS mRNA translation.